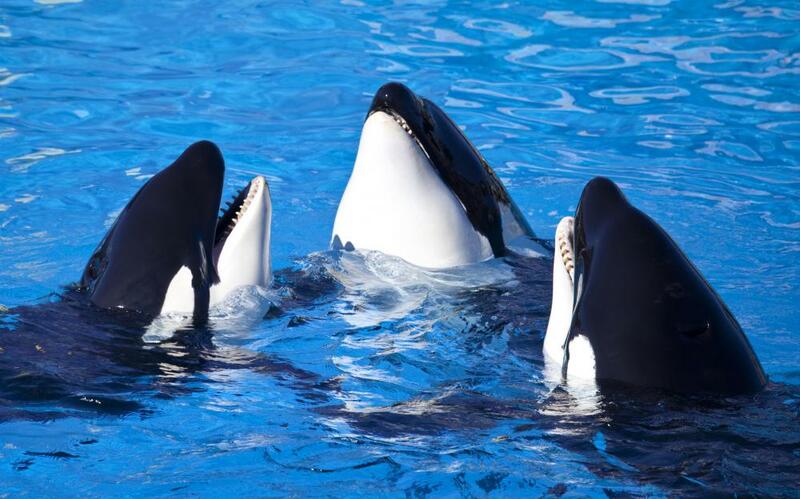 Killer whales prey on chinook salmon. The chinook salmon, also known by the scientific name Oncorhynchus tshawytscha, is a large fish that is native to the waters off the west coast of North America. This species has been found from Alaska to California, and the largest specimen ever caught weighed in at 126 lbs (57.27 kilograms). This species of salmon is bluish-green in color on its back. The color of the fish becomes lighter towards the sides, where it fades to a silver shade. The belly of the chinook salmon is white. Mature males who are ready to spawn have a hooked upper jaw, while in females, the nose is blunt in shape. Both commercial and recreational fishermen attempt to catch this species of salmon. Trolling, where baited hooks are dragged behind a fishing vessel, is an effective way to catch them. The chinook salmon is also one of the favorite types of prey of killer whales. The salmon hatches in fresh water and spends the first year or so of life there. At that point, young fish (smelt) migrate to the salt water of the ocean. They spend between one and five years there and return to fresh water to spawn before dying. During this phase of the chinook salmon's life, the coloring on the fish's belly and fins changes and can range from a deep red tone to copper or a deep grey color, depending on the age of the individual. Before laying eggs, a female chinook salmon will scoop out a number of nests in the gravel of a river bed. She will choose areas where the water is deep and fast-moving for this purpose. Once the nests are prepared, she will lay up to 14,000 eggs, which are then fertilized by the male. The newly-hatched chinook salmon, known as alevins, don't emerge from the relative protection of the gravel immediately. The young fish are attached to a yolk sack after hatching and remain in the gravel until this source of nutrients has been absorbed. The juveniles, called fry, will emerge from the gravel nest in late winter or early spring. A recently-hatched chinook salmon will eat plankton at first and then move on to insects as it grows larger. Once the salmon has moved into the open ocean, its food sources expand to include crustaceans, squid and herring. The mature salmon may travel thousands of miles to their home stream when it's time for the spawning season. During this time, the fish do not eat, which means their condition deteriorates as they move toward the location where their eggs are laid. What is a Pink Salmon? What is a Red Salmon? What are Salmon Oil Supplements? What are Salmon Oil Benefits? What are Some Ways to Prepare Salmon?